Invisible Structures, Inc., has been in the stormwater management business since 1982 with our porous paving systems Grasspave2 and Gravelpave2, ring and grid structures for grass and gravel drivable surfaces. 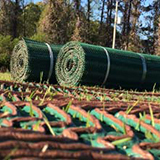 Large rolls sizes cover areas quickly while either protecting grass roots from compaction or containing small gravel to eliminate gravel migration. These products have extensive design brochures that cover all aspects from project photographs to latest technology and specifications.